View photos, videos (including a talk by John J. McKetta), and blog posts related to the 2013 Spring Meeting & 9th GCPS. 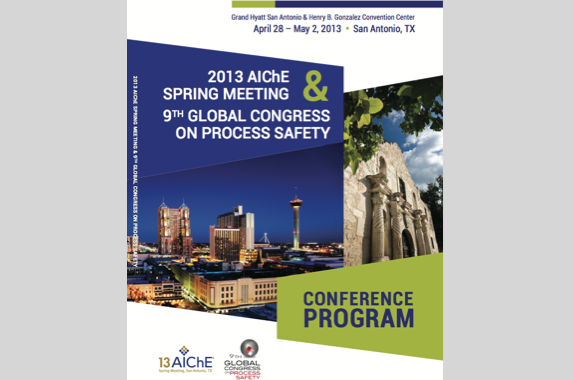 This year the program for the 2013 Spring Meeting and 9th Global Congress on Process Safety can be accessed from almost any laptop computer, tablet or mobile device. Aamir assumed the role of Regional Vice President Manufacturing – Americas at Shell in October 2010. In this role Aamir is a member of the global Manufacturing Leadership Team with responsibilities for manufacturing sites in Canada, the United States West Coast and Argentina. Dan Romasko joined Tesoro Corporation as Executive Vice President, Operations in 2011. As a member of the Tesoro executive committee, Dan’s responsibilities include co-creation of the corporate strategy. As the principal operating officer, he oversees Tesoro’s refining, marketing, logistics and marine functions, providing leadership that promotes the safe, compliant and profitable strategy execution.